This was mostly Brian’s idea, and it turned out so great. He is an amazing cook, has been since the day we met. He is also very creative and can come up with some great ideas for our next meal, if I am drawing a blank. Although I do most of the cooking, because I love it, and well I am home more than he is, he has never let me down when he takes the reigns and gets cooking. I was rummaging through our fridge to see what we could make for dinner, and I really did not feel like going to the store, plus we had plenty of food to make something, I just did not know what to make! I told B we had ground turkey, broccoli, mushrooms, and lettuce, so start thinking. He quickly responded, lettuce wraps, I thought brilliant! Let’s do this. I have always loved lettuce wraps, as long as the meat filling is delicious of course. They are filling, and most of the time healthy. You can use any kind of meat you may have, any veggies, spices, dipping sauces, and the possibilities are truly endless. We went to the Orient, and Middle East for these, and they turned out absolutely wonderful, full of flavor, and juice. It is great when you can come together in a kitchen with your significant other, siblings, friends, and or family to get cooking. It brings enjoyment, laughter to my life, and brightens my day, I love it. A bit of advice from time to time, I suppose. Do not always cook alone, it may seem like a good idea because yo have full control of your kitchen, but you don’t. Share this time with your children, and anyone else who you think may enjoy it. For some reason food has always been what brings people together in good times, no times, bad times, and just any old time. So share your time, recipes, and love for the kitchen with your loved ones, you will not regret it, I assure you. Remember for this you can get creative and use whatever you have in your fridge. I served this with fresh romaine lettuce, and a sesame orange soy dipping sauce. You can make any sauce you like, and serve with iceberg lettuce, even butter lettuce, even serve it as an appetizer for your guests. Or follow this recipe to lettuce wrap heaven. 1. Heat oil and butter in a large 12 inch skillet. When oil is shimmering, add turkey to brown, cook for 10 minutes. Add salt, pepper, cumin, pepper flakes, chili powder, paprika, stir to combine. 2. Add broccoli, onions, and mushroom. Cook for 5 minutes, or until broccoli is al dente and meat is fully cooked. 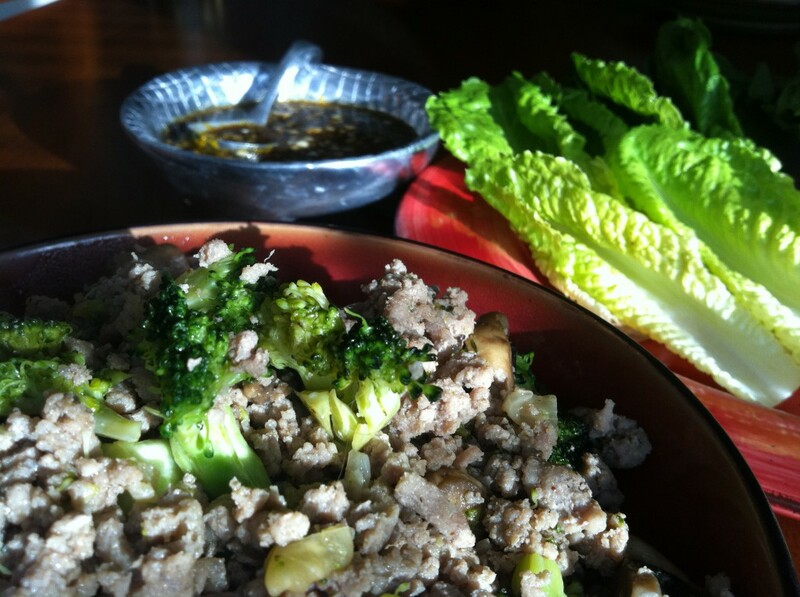 Mix all ingredients together well, and serve at room temperature with hot meat for lettuce wraps.